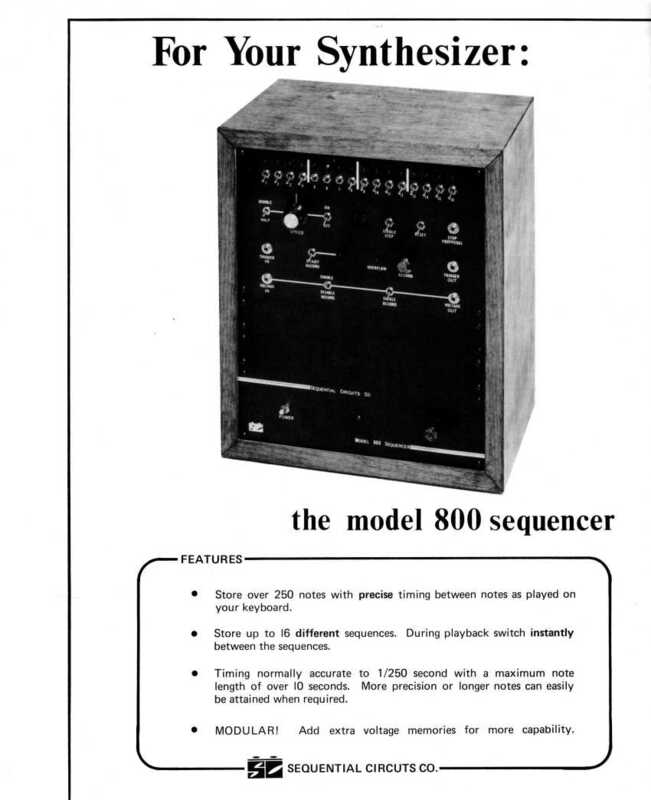 The Sequential Model 800 Sequencer is a 256-event cv/gate sequencer based on microprocessor technology. 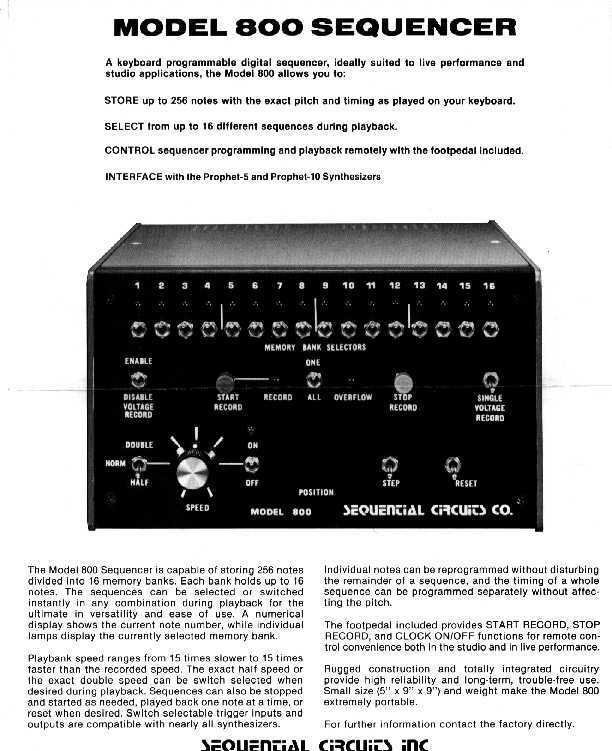 This was probably Sequential's first product. Dave Smith started making these units in his garage. Early serial numbers even feature a strange sci-fi looking Sequential logo. It was built like a tank, encased in a 8"X10"X5" metal box. It represents one of the first attempts at a commercial meld between analog and digital technology. The 800 consists of 16 toggle switches which enable "cells". Each cell can hold up to 16 note-events each. The cells are loaded from CV (control voltage) keyboard via the CV/gate inputs (1 volt per octave) and can be programmed over a 5-octave range. The Gate is switchable between S-trigger and voltage gate. An internal clock runs from 20Hz up to 5kHz to calculate absolute note length or beat division if being driven externally by a low frequency clock. External input is provided via a specially wired plug. A multi-pin parallel connector is used to hook two or more 800's together. A foot-pedal was available for toggling between record and play modes and start/stop. The CV/gate output is quantized to semitones (1/12). The gate can also be switched between S-trigger and voltage gate. Sequences cannot be stored, however there may have been a battery backup modification. If a hi freq VCO is used to "clock" the sequencer, it can function as a crude audio waveshaper.